I am a keen photo editor, using Photoshop to enhance pictures of Jewelry for my wife's eBay and Etsy stores. Upon entering the world of photo editing, I spent weeks researching the best photo editing monitors out there. I found all websites to be unusable and clogged up with adverts and so resolved to start best27inchmonitor.com to help others in the future. On the premise that a workman is only as good as his tools, a gamer is only as good his set up. That’s not to say that in both instances skill, hard work and talent don’t play a part; but you wouldn’t see a professional athlete running in second hand plimsolls would you? So to make sure you’re fully informed we asked an E-Sports Manager on what to expect from your monitor, and how to make sure you’re getting the best gaming monitor you can afford. If you were going to choose a monitor for us, what would you choose? Top 3. This monitor is targeted at professional users, it has Quad HD display and has loads of the features auser with an interest in graphic arts and photography would expect to see. It has a 2560×1440 pixel resolution and offers consistent colour with wide viewing angles. The PHILIPS 271P4 may not look particularly stylish, but it has a fully height-adjustable stand which pivots 90 degrees, three USP ports, a pair of HDMI connectors, DVI Dual-Link and Display Port with the ability to connect more than one port at a time for a side by side multi-input display. The screen has a matt anti-glare coating and there is an integrated 2Mp webcam with a microphone and an LED indicator. An extra special feature I’ve not mentioned yet is the ‘people sensor’ which detects when you are present in front of the monitor and dims when you’re not, saving power. Asus has been growing into its high-end display marker. Not content with being one of the original companies to offer 4K monitors, Asus has a new professional display that promises colour accuracy in a range of screen sizes. The Proart PA279Q is the 27 inch version which also has a matt anti-glare IPS panel. 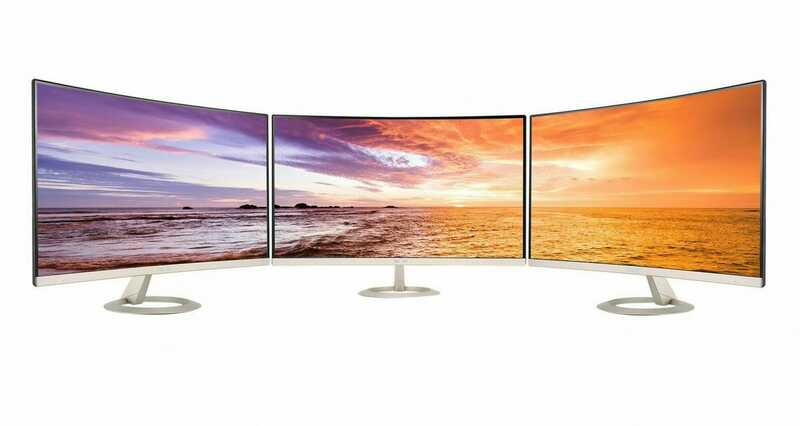 As with other high-end displays it has the WQHD 16:9 resolution of 2560 x 1440 pixels. The listed response time of 6ms suggests it should be fine for gamers as well as graphics professionals. It has the pivot ability and tilt options. All the connectors are digital. At the back, there’s one HDMI,one DVI and two DisplayPort connectors, but only one of them is an input.There’s a USB 3.0 upstream port to connect to your computer, which enables six USB 3.0 ports on the display itself, one of which is specified as a battery charging port. And topping off the list is a ‘9-in1’card reader, which supports both SD and Sony Memory Stick cards. The sound quality it pretty poor, with tinny sounds and crackling when loud bass passes through. The VP2772 is the updated version of the VP2770-LED display. Both are widescreen 27 inch IPS monitors, with healthy resolutions of 2560×1440 pixels. But the update includes a ‘SuperClear’ screen with an IPS panel from LG with a matt anti-glare hard coating, making it useable in most lighting conditions. Unlike the earlier VP2770-LED model, the VP2772 now relies on an external power supply, a laptop-style little brick on a cable, which seems to be a step back in usability, but its colour compatibility more than makes up for it. As a monitor aimed at professionals, the VP2770 has a fully adjustable stand, and it can be raised to sufficient height to enable the screen to swivel 90 degrees for use in portrait mode. The touch-sensitive controls are poorly designed, they feel kind of budget, plus the display can reach a 62W power consumption at full brightness. What should you prioritise when looking for a decent gaming monitor? ESM: Across the board, Monitor Frequency (Hz) and the monitor panel are the two top priorities when choosing your best gaming monitor. By this I mean the number of cycles per second the monitor is working at and the type of monitor panel you want.The higher the level of Hz, the more times your monitor refreshes its image per second. This means a far more unfluctuating image, and it’s less harsh on your eyes since it’s processing the same information over again, making it appear ‘less’. However, this is only the case if it matches the number of frames per second that your graphic card is processing. If your monitor expects more images a second than it’s actually receiving, then you return to the jarring picture you were trying to avoid in the first place. Don’t be fooled into thinking you need the higher Hz every time though. When it gets to the point where your eyes can’t register the quick cycle of images, it won’t make any difference. ESM: As for monitor panels, your choices are split between TN and IPS. TN is the most common, cheaper and has the shortest response times. They are good for brightness, due to the increasingly common LED back-lighting, and consume low energy. However, you can and will experience colour shifting at different viewing angles and colour accuracy is poor. The best gaming monitor will use an IPS panel which are more expensive, newer technologically and offer good quality viewing angles with great colour consistency. However, they don’t have the solid response times of the TNs and you’re limited to 60 Hz for now. For all of the readers who don’t know what those terms mean, what are a TN panel and an IPS? ESM: A TN panel is a Twisted Nematic panel. An IPS is an In-Plane Switching panel. It’s technology developed by Hitachi in the mid-1990s, hoping to fix the problems the TN panel had with colour and angles. What kind of a difference does size and resolution make? ESM: It’s a cliché, but bigger screens are better. A 27” screen provides plenty of screen space, and Full High-Definition (a resolution of about 1,920 to 1,080). Some newer 27” models are Wide, Quad High-Definition monitors with maximum resolutions of 2,560 by 1,440 pixels. The higher pixel count provides a far sharper image than a standard FHD, but you’ll still need a graphics engine to keep up. Especially if you want all of the effects enabled on your best gaming monitor. What other additions do you expect from your monitor? ESM: A variety of video inputs is a must. I like to play on multiple PCs and gaming consoles so Dual HDMI ports and USB ports are essential. Other than that, it’s important to make sure you’ve got good quality external peripherals: i.e. Gaming controllers, mice, memory cards. A powerful speaker system or decent headphones will make a massive difference to your gaming experience. I have the HyperX Cloud Headset, and the entire world disappears when I start gaming. They have a 15 – 25Hz frequency response, detachable microphone and closed cup for enhanced bass reproduction. When it comes to stands, what are the things we should know? ESM: You may not need every adjustment option under the sun, but so long as your main requirements are met then you might as well find a best gaming monitor that supports tilt, swivel, pivot and rotation adjustments. It may sound basic, but it’ll make a difference depending on your set up – which has the potential to change depending on how much of a fidget you are. Most monitor stands allow you to tilt your display or raise the height of the screen relative to the base of the stand, but there are also monitors that can rotate from a landscape to portrait orientation, or put another way, from a wide screen to a tall screen. There are also some that allow you to swivel the screen without moving the stand. It’s important to know what you’re looking for, and if you can, invest in a monitor with a stand that features as many of these options as possible. You’ll usually pay a little more for these added features, but they can come in handy. What kind of price can we be expected to pay for a decent monitor? ESM: It will depend on which monitor you go for, but a full blown 27” model with all the bells and whistles can cost $600 and up, but the standard is about $200 . Monitors bigger than that will go beyond $3,000 . 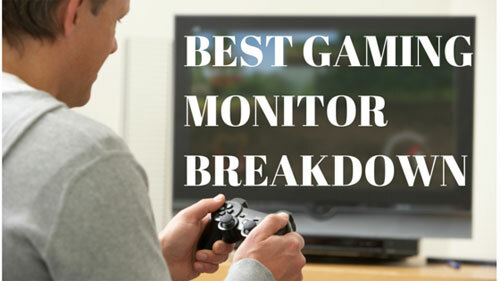 So narrowing down your choices for the best gaming monitor should be pretty easy then? ESM: As long as you know what you want. It doesn’t hurt to try out different options, especially when you’re investing hard earned cash like this. Even if you’re looking to buy online, trying out a monitor in a physical retail store first might help you make the decision. Equally, knowing the prices of the monitors online and speaking to a sales rep at the store might lower the price. I’m not saying this to be stingy, but where you put your money with regards to your monitor is important. Even with the standards that exist, a Dell and an Asus monitor are going to be different, and arming yourself with the knowledge to understand what you’re getting is really important, but your first-hand experience will be the ultimate decider on which monitor is worth the money and is ultimately the best gaming monitor for you.